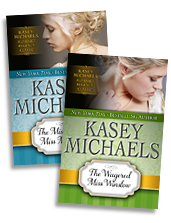 Kasey's romantic and funny mysteries! The Enterprising Lord Edward — Re-released! Role of a Lifetime — a time travel novella in Everlasting Love novella. Or You Can Let Him Go — Delacorte hardback/Dell Paperback. The true story of her eldest son's first kidney transplant.